One of the biggest disadvantages of the old Edge was its paucity of third-party plugins (only 228 at the time of writing). 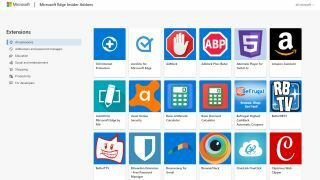 The switch to Chromium changes all that, and although the new Microsoft Edge Insider Addons store isn't anywhere near as full as the Chrome store, it already boasts 118 extensions and is likely to grow rapidly now that developers no longer have to remake their plugins from scratch for Edge. As BetaNews reports, you can access the new store within the new Canary and Dev versions of Edge by clicking '...' at the top right to open the main menu, then selecting 'Extensions'. Although we foresee the number of extensions for the new Edge rocketing in the near future, it's unlikely to ever equal the sheer volume available for Chrome. If the Microsoft Store is anything to go by, Microsoft is likely to keep a pretty right rein on the plugins it allows to appear in the official Edge store. However, the Edge store might also offer some tools that aren't available for Chrome. For example, Google refuses to list extensions that allow users to download videos from YouTube, but the newly minted Edge store includes a plugin specifically for this purpose. It will be interesting to see whether Google tries to prevent Microsoft listing such tools in future.